One of the photographs included in the Infrared 100 exhibition was by Carol Highsmith. She's been going round the USA for the Library of Congress with a medium format camera with a digital back and has shot some fantastic infrared images ... and in the digital world medium format means resolutions of 40 megapixels and more. 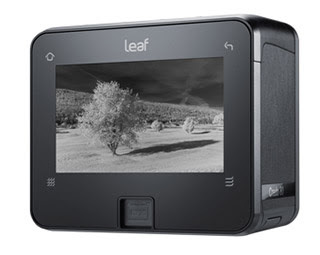 In Carol's case her back had to be converted but Leaf have now announced a wide spectrum medium format back 'out-of-the-box' called the Leaf Credo WS ... for wide spectrum. Leaf's leaflet (!) [info on their web site] explains that you can use the back to shoot infrared with an infrared-pass filter, normal images with an infrared blocking filter and Infrarcolor with an orange/red filter. (By this I assume they mean the faux colour images we're used to seeing.) The back may also shoot UV but I don't know that for sure as yet and it is very lens dependent. There are two versions with resolutions of 60 and 80 megapixels. 80 megapixels is 10,320 by 7752 pixels. A wide spectrum camera is great news (although this one will probably set you back over £30 thousand) and a back like this can be used on bodies such as Mamiya (who own Leaf) or technical cameras and Leaf rightly point out that since you don't work with a viewfinder on a technical camera (you use a screen in place of the imaging plane) the built-in hires screen on the back will be very handy. The manhunt for the remaining Boston Marathon bomber ended when he was discovered hiding in a boat in a back yard. As this page from NBC's Photo Blog shows, the fugitive's body can clearly be seen even though he was underneath a kind of tarpaulin that was protecting the boat from the weather. There's (over compressed) movie (pity about the commercial) but, further down, a couple of hi-res stills. A further story explains more about the thermal imaging and, eventually, explodes the myth that you can see outlines of people through walls using far infrared/thermal imaging ... despite what CSI would have us believe. You can however see through thin sheets of plastic, such as a bin liner, at these wavelengths which can not be imaged with a conventional camera. I've known Colin Jackson from the BBC Natural History Unit in Bristol for a few years. He has presented his work, filming wildlife at night using near-infrared and thermal cameras, at both the Infrared 100 symposium and at IBC. I just came across a video from June 2012, tips on infrared filming, on the BBC Academy of Production web site. In it, Colin is shown using what he calls the 'kebab shop camera', a standard definition surveillance camera made by Ikegami. These days he is using a Canon DSLR with its infrared-blocking filter removed which will produce HD resolution images. You should also know that, if memory serves, his infrared lighting is at 920 mn. What he doesn't talk about in this video is using thermal imaging. There, as you probably know, you don't need lighting as a thermal imager shows the photons generated by the objects themselves.